Lately my Gateway (http://www.gateway.com/home/)100MHz Pentium purchased in September 1995 had been showing it's age. With all the multimedia programs I was getting into even 64MB of RAM did not help. I had been teetering back and forth for sometime trying to decide on upgrading my P5-100 or going for a full blown new computer with a 450 or 500 MHz processor complete with all the latest bells and whistles. It's the age old computer dilemma of when is the right time to buy knowing you will be obsolete as soon as you buy. My reasoning goes something like: "Prices keep falling on computers and computer components, so the longer I delay, the more computer I can get for my money." This is coupled with: "Do I want to deny myself all these great multimedia programs available for free on the Internet because of my slow processor speed?" I decided to take a middle ground approach. If I could upgrade my processor enough to handle most multimedia programs (meaning above 200MHz) at a cheap enough price (meaning less than $100) it would be worth it to delay getting a brand new computer. The other aspect of this is if I could upgrade my processor speed enough I could always network the old computer to a new one later without it being too much of a drag on the new system. In mid July CompUSA (http://www.compusa.com) had a "Power Buy" sale on a PNY Technologies (http://www.pny.com/) QuickChip 233MHz 3D Processor Upgrade for $99.99 with a $30 mail-in rebate. This upgrade chip includes both the MMX and 3D-Now instruction sets. The $70 final price certainly appealed to me but would the thing really improve my system was the question. Back in the Spring CompUSA had a similar sale on the Evergreen MX Pro-200 (http://www.evertech.com/products.asp) for $60 after rebate. I almost bought into that until I did some research on the Internet. The MX Pro-200 did not include the 3D-Now technology and did not significantly improve floating point operations. I got the impression from reading user comments that the MX-Pro 200 was okay but no great shakes in improvement. One of the best places to go for finding out how good products really are is Deja.com (http://www.deja.com/). Type in your item name and Deja will search all the newsgroups and give you a listing of headers for comments from people that actually own the item or have used it. Recognizing that there might be some bias Deja also includes a posting history for the individuals so you can check other comments they have made. You can easily track the threads of message headers and then form you own opinion. Another area I check (besides the manufacturer's own web site) is the hardware web sites. A number of them are listed on the SCPCUG Hardware Links page (http://www.scpcug.com/hardlink.html). If it's a well known item, you can usually find a review by somebody, somewhere on the Internet. That's where you get to practice using Search Engines. Check the SCPCUG Search Engine Links page (http://www.scpcug.com/findlink.html) for a variety of Search Engines to get you started. My research on the PNY QuickChip 233MHz yielded little from the PNY site. I was quite surprised their site was so out-of-date. They talked about a QuickChip 200MHz and 200MHz 3D (http://www.pny.com/tech/quickchipprocessor/index.cfm) but the QuickChip 233MHz 3D was not even mentioned. I went to Buy.com (http://www.buy.com) which incidentally is a "must check" on prices when you are in a buying mood. They have some of the best prices on the Internet. Anyway, Buy.com did not even show a QuickChip 233MHz. By now I was beginning to wonder if CompUSA had a typo error. I went to CNET Shopper (http://www.shopper.com/) and did a search. Only four companies had a listing for the QuickChip 233MHz. Prices varied from $146 to $115 so at least now I knew it existed and that CompUSA's price was by far the lowest. I also had found in my search a review of the history of the Winchip. 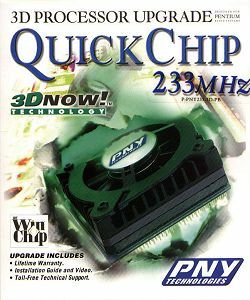 Although PNY sells this QuickChip 233MHz 3D upgrade the actual chip is a IDT WinChip (http://www.winchip.com/index2.html). The review by JC's PC News'n'Links (http://www.jc-news.com/pc/article.cgi?Centaur/W2_Review) while not focusing specifically on the 233MHz gave me enough insight to take the gamble and buy it. The QuickChip 233MHz comes with a 15 minute VHS videotape, 18-page Installation Guide, and 3.5" floppy disk. Eight minutes of the video shows you how to install the upgrade for a Pentium processor and seven minutes cover the same for a 486 processor upgrade with their QuickChip 133MHz upgrade. The video shows you visually basically the same information contained in the Installation Guide. The floppy contains a utility for checking your processor speed before and after the installation. It is very basic and just confirms for you that indeed you are running at the upgrade speed after installation. Better utilities are available for free on the Internet. Before I did the installation I used several programs to benchmark my 100MHz processor. I could then rerun them after the installation to see if I had indeed improved. I used Norton Utilities (http://www.symantec.com/nu/index.html), SiSoft Sandra (http://www.sisoftware.demon.co.uk/sandra/), and CliBench (http://hotfiles.zdnet.com/cgi-bin/texis/swlib/hotfiles/info.html?fcode=000IE1&b=). My biggest problem with the installation was getting the old 100MHz processor's heatsink u-shape spring clamp off. This clamp ran on top of the midsection of the heatsink and was held on by lips on opposite sides of the processor's ZIF (Zero Insertion Force) socket. Pressing on the clamp only started bending the motherboard as there was no support directly underneath the ZIF socket for the motherboard. I was afraid I was going to crack the motherboard. The video showed easy removal of an old processor with a fan rather than a heatsink. The PNY Installation Guide and video said to refer to my computer owner's manual for guidance if I had a heatsink clamp. So I got out my Gateway owner's manual. It said, "Carefully remove the heatsink clamp from the top of the processor". Big Help! After much consultation with the wife, who quickly said "I don't know", I decided to use a screw driver and wedged the clamp out from under the lip on the side furthest from the processor. Here I was pressing only against the edge of the ZIF socket. Well when that clamp reached the edge of the lip, it's spring action really cut loose. It flew up and hit the ceiling. Maybe I should have been wearing safety glasses but the manuals provided no warning. That was the hard part. Next I lifted the ZIF socket lever and easily removed the 100MHz processor. The new 233MHz processor with fan attached (rather than heatsink) went in just as easy by aligning pin 1 of the processor with the pin 1 notation on the motherboard. I closed the ZIF socket lever and was finished except for connecting the fan power. PNY provides you with the proper connectors to steal fan power from one of your hard drives if you don't have a spare power cable. You pull the power cable connector from your hard drive, insert the fan power connector in its place and then plug the drive power connector into another connector on the fan power cable. In my case of replacing a 100MHz processor I did not even have to change the system bus speed on the motherboard which remained at 66MHz. For replacement of 75, 90, 120, or 150MHz Pentiums the system bus speed must be changed on the motherboard to 60MHz. This is no big deal and usually involves flipping a dip switch. So what happened when I booted up? The computer booted up normally (maybe even a bit faster) except the bootup screen still showed I had a Pentium 100MHz. I was warned about this. The reading is from the BIOS (Basic Input/Output System) and purely cosmetic. When I tried opening a few programs I definitely noticed a much quicker response. I ran the PNY Bench test off the supplied 3.5" floppy. Sure enough, it said I was now running at 232MHz. I figured that was within tolerance but why not use the opportunity to check on the response time of PNY's Tech Support. I called the toll free number and was on hold less than 5 minutes before a technician answered. He confirmed that the 232MHz reading I received was in tolerance. He said it could be 232, 233, or 234MHz depending on my system's tolerances. Okay, next a check with Norton Utilities System Benchmark. My old 100MHz said I was 19.5 times faster than a 16MHz 386SX. With the processor upgrade I was now 45 times faster. Wow! I tried CliBench and it also confirmed I was running much faster. CliBench runs several tests including Matrix Operations, Floating Point Performance, Number Crunch Performance, etc. Without getting into details my Total Performance increased 161 percent over the Pentium 100MHz. Finally I tried SiSoft Sandra's CPU Benchmark. It again confirmed my increased performance. This was the only program that correctly identified the new processor as a IDT Winchip 232MHz 3D processor. Interestingly it claimed my Pentium Performance Rating was equivalent to a Pentium 267MHz. Bench tests are fine in that they set common standards so comparison is possible between processors but I wanted to know if the improvement was significant in the programs I use. One program that I knew would show this up was my voice recognition program Simply Speaking Gold (http://www.software.ibm.com/is/voicetype/us_gold.html). I was not disappointed. Dictation processing was much quicker than with the old chip. The same held true for RealJukebox beta (http://www.real.com/products/realjukebox/index.html). Before I could not encode a 2 min audio CD at 44Kbps stereo into RealMedia format. I was limited to a setting of 32Kbps mono. Of course the minimum requirement for RealJukebox was a Pentium 200MHz MMX so I was really pushing with my Pentium 100MHz. But with the processor upgrade, no problem now! Bottom line is the upgrade was well worth it. My days of processor intense programs that previously ran in a limited fashion were gone... that is until I start pushing the performance curve with more complex programs again.